Pack your basket with everything else you need while this bakes, because your entire feast will be ready in no time. This recipe is a triple threat. 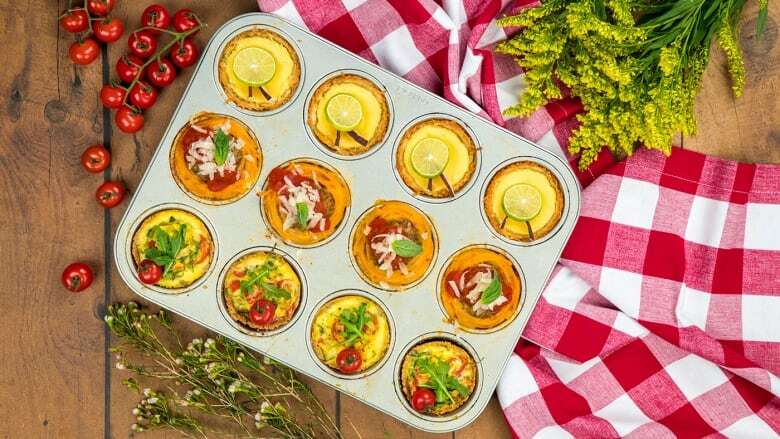 Using a 12 tin muffin tray you can make complete meal - an appetizer, entree and dessert that cooks at the same time and temperature. Watch how quickly it comes together, and then jump down to the recipe below. It’s perfect for a weekend picnic or school lunches. A great tip when assembling is to have all of your prep work done ahead of time and grease or spray the entire tin with oil. Once the ingredients are prepped, start assembling the Tomato Ricotta tart, then the Spaghetti and Meatball cup and finally the Key Lime Coconut tarts. Each course makes enough to fill 4 muffin tins. In a medium bowl, mix together bread crumbs, melted butter, beaten egg and parmesan cheese until mixture binds together when pressed. Divide crust mixture evenly between the first 4 muffin cups and press into the bottom and up the sides, set aside. In a medium bowl, combine ricotta, egg and lemon zest, and season to taste. Fold in tomatoes and arugula with a spatula. Divide mixture evenly between prepared crusts and smooth tops with a spatula. In a large bowl, toss together spaghetti, beaten eggs and and parmesan cheese. Cut spaghetti strands in half with scissors. Divide spaghetti evenly between the middle 4 muffin tins and press down into the bottom and up the sides to make a little nest. Set aside while preparing meatballs. Place the ground meat in a large bowl. Sprinkle the breadcrumbs, salt, pepper and parmesan cheese evenly over the meat, and add egg, parsley and garlic. Mix with hands until just combined. Divide mixture into 8 and roll into balls. Place one meatball in each spaghetti nest, drizzle with olive oil. Freeze the extra meatballs for another time. Cover the Tomato Ricotta tart and Spaghetti and Meatball cups with plastic wrap to ensure there is no crossover of ingredients when assembling the key lime coconut tart. Combine all crust ingredients in a medium bowl and mix until combined. Press into remaining 4 muffin tins and set aside while you make the filling. Whisk all filling ingredients together and divide evenly between prepared crusts. Remove the plastic wrap and bake the entire muffin tin for 30-35 minutes. If the edges of the key lime tart are browning too quickly, cover with a sheet of tin foil. Cool completely and using a knife or small pallet knife, remove all of the tarts onto a plate. Garnish the Tomato and Ricotta tarts each with arugula and cherry tomatoes. Top the Spaghetti and Meatball cups with a spoonful of marinara sauce, some grated parmesan cheese and a basil leaf. Finish the Key Lime tarts with toasted coconut chips and key lime slices.